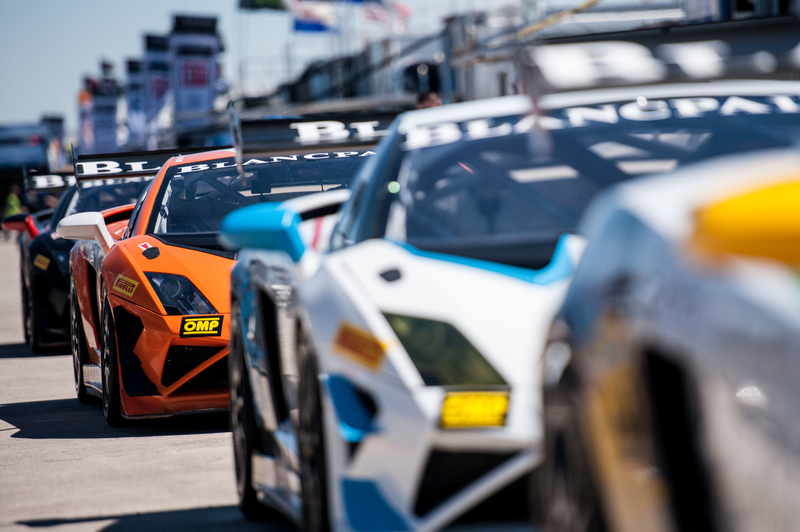 DANVILLE, VA--(Marketwired - August 20, 2014) - A season of consistent speed could produce a second consecutive Lamborghini Blancpain Super Trofeo North America championship for Kevin Conway at the next two rounds of the series, Aug. 23-24 at Virginia International Raceway. Sealing the Drivers' Championship at VIR would be especially gratifying for Conway and Change Racing. VIR, located near the Virginia-North Carolina border, is the closest circuit to Conway's home and the Change Racing headquarters near Charlotte, North Carolina. Conway and teammate Victor Gonzalez Jr. also represent Lamborghini Carolinas -- located in Greensboro, North Carolina -- in the Lamborghini Blancpain Super Trofeo North America. A field of 18 cars -- a record for the North American series -- is expected to race on the 17-turn, 3.27-mile circuit this weekend at VIR. Race One is scheduled for 6:30 p.m. (ET) Saturday, Aug. 23, with Race Two following at 1:45 p.m. Sunday, Aug. 24. Both races will be streamed live at squadracorse.lamborghini.com/en/live-usa. Practice will take place Friday, Aug. 22, with qualifying at 11:45 a.m. Saturday. The two rounds at VIR continue a busy stretch of action worldwide for the Lamborghini Blancpain Super Trofeo championship, which continues to reach new levels of success at every round in Europe, North America and Asia. The Asian Lamborghini Blancpain Super Trofeo championship resumes Aug. 30-31 at Fuji Speedway in Oyama, Japan. The Lamborghini Blancpain Super Trofeo Europe last competed July 25-26 at Spa-Francorchamps, Belgium, with the next event Sept. 19-21 at Nurburg, Germany. 2013 series champion Conway leads the Lamborghini Blancpain Super Trofeo North America Driver Classification with 88 points entering this weekend. Conway, the driver of the No. 29 Change Racing Gallardo LP 570-4 representing Lamborghini Carolinas, has two victories and five overall podium finishes in eight rounds this season. Consistency has been Conway's hallmark this season. His lowest finish of the season is fourth. Farano, from Toronto, enters VIR second in the championship with 58 points. His title hopes took a significant dent last month at his home track, Canadian Tire Motorsport Park, where he scored just three of a possible 30 points in the No. 63 entry fielded by Jota Corse and representing Lamborghini Dallas. Gonzalez, from San Juan, Puerto Rico, has been the hottest driver in the series this summer. Gonzalez has scored 45 combined points in the last four rounds -- more than any other driver -- to climb to third in the Driver Classification in the No. 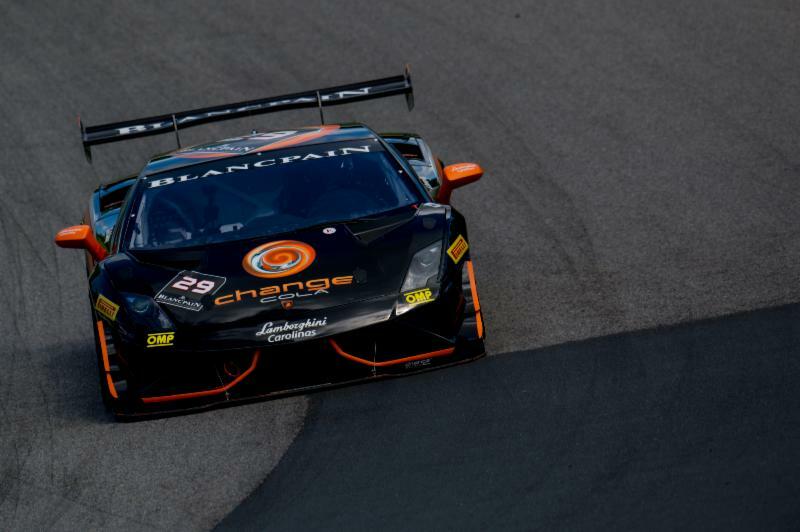 99 entry fielded by Change Racing and representing Lamborghini Carolinas. He earned his first victory of the season last month at Canadian Tire Motorsport Park in a brilliant drive in wet conditions. While Conway appears to be on the brink of a second Drivers Championship this weekend, the race for the Amateur class title remains tight entering VIR. Kevin O'Connell leads the Amateur Driver Classification with 28 points in the No. 9 entry fielded by Rick Ware Racing and representing Lamborghini Houston. Dylan Machavern jumped to second among Amateur drivers with 27 points after the last event weekend at CTMP, where he earned his first overall victory of the season. Cody Ware, 18, is third in the Amateur class with 20 points and will be back in action at VIR in the No. 38 Lamborghini Gallardo LP 570-4 fielded by his father's team, Rick Ware Racing, and representing Lamborghini Long Island. The Lamborghini Gallardo LP 570-4 Super Trofeo car is the ultimate single-make race car and the only four-wheel drive GT racer in the world. The 570-horsepower, V10 Gallardo LP 570-4 features impressive technology such as paddle shift E-gear transmission, Öhlins race shocks, Brembo brakes, a carbon fiber aerodynamic package that includes a rear wing with 10 adjustable positions, MTA data acquisition, air jacks, center wheel locks and more. There also will be plenty of activity off-track activity for the Lamborghini Blancpain Super Trofeo North America this weekend at VIR. A media technical briefing about the newest Lamborghini race car, the 2015 Huracán LP 620-2 Super Trofeo, will take place from 4-5 p.m. (ET) Saturday at the Lamborghini Village at the circuit. Lamborghini chief test driver Giorgio Sanna will give the presentation, which is open to accredited media for this event. The Huracán will be on display for only the second time in North America. The car made its worldwide debut Aug. 15 at The Quail in Carmel, California. The Huracán LP 620-2 will begin competition in 2015 in all three global Lamborghini Blancpain Super Trofeo series, Europe, Asia and North America. Lamborghini and Blancpain also will provide world-class hospitality this weekend for clients and guests of Lamborghini dealers. Guests also can participate in the IMSA Hot Lap Experience, high-speed rides around the VIR circuit in a Lamborghini Aventador LP 700-4. Founded in 1963, Automobili Lamborghini is headquartered in Sant'Agata Bolognese, in Northeastern Italy. The Lamborghini Huracán LP 610-4, which has made its world debut at the 2014 Geneva Motor Show, is the successor to the iconic Gallardo and redefines the luxury super sports car driving experience with its innovative technology and outstanding performance. The Aventador LP 700-4, in Coupé and Roadster offerings, represents the reference point in the world of V12-powered, luxury super sports cars. With 129 dealerships worldwide, in half a century Lamborghini has created an uninterrupted series of extraordinary, exclusive cars that include the 350 GT, Miura, Espada, Countach, Diablo, Murciélago and several limited series like the Reventón, Sesto Elemento and Aventador J. The Veneno Coupé, the Egoista and the Veneno Roadster have been created to celebrate the brand's 50th anniversary year in 2013. For more photos and videos, please visit media.lamborghini.com and www.thenewsmarket.com/lamborghini. For more information on Automobili Lamborghini, please visit www.lamborghini.com. From the creation of components through to watch design, Blancpain is distinguished by its ability to develop exceptional movements. Over the past nine years, the Manufacture has indeed developed no less than 32 new calibers. Through its various models, Blancpain preserves its heritage of precision and elegance, while also displaying an innovative and occasionally provocative spirit. Its range encompasses the sportive L-evolution line, the legendary Fifty Fathoms diver's watch, as well as the classic Villeret collection, the high complication from Le Brassus collection and the Women models. For more information about Blancpain, please visit www.blancpain.com. Founded in 1872, Pirelli is the world's fifth-largest tire manufacturer based on revenues. With a presence in over 160 countries, the company now has 22 tire manufacturing facilities on four continents and employs some 38,000 people. Having been involved in motor racing since 1907, Pirelli has been confirmed as single tire manufacturer for Formula 1™ for the 2014-2016 championship seasons and for the World Superbike Championship. This is an important challenge in terms of technological innovation and is a key means of promoting the Pirelli brand. In 2014, Pirelli underlines its status as the global tyre manufacturer with the biggest commitment to motorsport. In total, the Italian firm supplies around 150 different championships across the world, excluding Formula 1, both on the road and on the track. One of the most important engagements is the Lamborghini Blancpain Super Trofeo, supplied exclusively by Pirelli, which highlights the strong technical collaboration that the two Italian icons have shared since 1963.